Leuven, Belgium – Feb. 2, 2016 – At this week’s IEEE International Solid-State Circuits Conference (ISSCC2016), nanoelectronics research center imec and Vrije Universiteit Brussel (VUB) presented a four-antenna path beamforming transceiver for 60GHz multi Gb/s communication in 28nm CMOS technology. The transceiver is a breakthrough in developing a small, low-cost, and low power solution for multi-gigabit communication targeting WiGig ® as well as 60GHz wireless backhaul applications. Due to the tremendous growth of mobile data traffic, display and audio applications, new spectral resources in the mm-wave frequency bands are needed to support user demand for high data rates. One way to realize this is through mm-wave wireless networks based on small outdoor cells featuring beamforming, a signal processing technique using phased antenna arrays for directional transmission or reception. The beamforming steers the radiation in the desired direction while achieving a good link budget that supports high spectral efficiency. Imec’s and VUB’s 60GHz transceiver architecture features direct conversion and analog baseband beamforming with four antennas. The architecture is inherently simple and is not affected by image frequency interference. Moreover, a 24GHz phase-locked loop that subharmonically locks a 60GHz quadrature oscillator is inherently immune to the pulling disturbance of the 60GHz power amplifier. 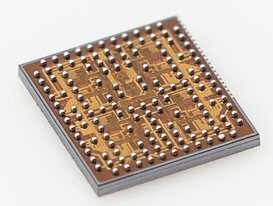 The prototype transceiver chip (7,9mm2), implemented in 28nm CMOS, integrates a four-antenna array. The chip was validated with a IEEE 802.11ad standard wireless link of 1m. The transmitter consumes 670mW and the receiver 431mW at 0.9V power supply. The transmitter-to-receiver EVM was better than -20dB in all the four WiGig ® frequency channels (58.32, 60.48, 62.64 and 64.8 GHz), with a transmitter equivalent isotropic radiated power (EIRP) of 24dBm. This allows for QPSK as well as 16QAM modulations according to the IEEE 802.11ad standard, achieving very high data rates up to 4.62 Gbps. Interested companies are invited to join imec’s 60 GHz R&D as a research partner and benefit from collaboration in imec’s Industrial Affiliation Program, development-on-demand, academic partnerships, or access to the technology for further development through licensing programs. Over 14,200 students, representing more than 120 nationalities study at VUB to take the next step in their career. 3000 of our students – more than 21% of our student population - are international students, making our institute a vibrant and truly global one. VUB supports more than 100 English-taught programs with both outstanding research and a modern campus. Everything you need is at your fingertips and available on-site, near Brussels' bustling city center: an extensive library, modern computer labs, state-of-the-art sports facilities, and exciting restaurants as well as interesting cultural activities, language courses and an invaluable job service. In VUB's eight faculties, students can choose to study and explore beyond their own discipline where they can exchange experiences, cultures, ideas and values. The University's open-door policy means students build rapport with both faculty members and assistants, and staff are happy to answer student questions. Small group workshops are also in place to provide close interaction and hands-on experience. Thanks to its expertise and location in Brussels, VUB is an ideal partner for prestigious research and education with an outlook on Europe and the world. With a research budget of EUR 86 Million, VUB covers some 2,200 publications and 24 reported inventions annually, supporting 150 research groups. VUB is a haven for education and research, combining the best of both on American-style green campuses. It is listed in the top 200 QS World University Ranking and 251 – 275 in the Times Higher Education Ranking. The university has more than 75 cooperation contracts in 38 countries. It offers postgraduate degrees in English and awards Bachelor’s and Master’s degrees in a range of academic fields covering human sciences, life sciences and medicine, sciences and engineering. Doctorates are offered in all subjects for which the university issues academic degrees. VUB counts more than 1,800 PhD students. Fill out this form for contacting a IMEC representative.